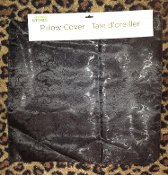 Gothic Decor Damask Brocade Fabric BLACK SQUARE PILLOW COVER Halloween Decoration- as pictured. This pillow cover will add a rich sophistication to any home. A true black color with a swirly floral design damask-style pattern. Very elegant with a hint of floral and paisley designs on the material. New Black Throw Pillow Cover Damask Fabric square shell pillow cover with nice narrow cord around the edge and 10-inch zipper on one side to slip pillow in.